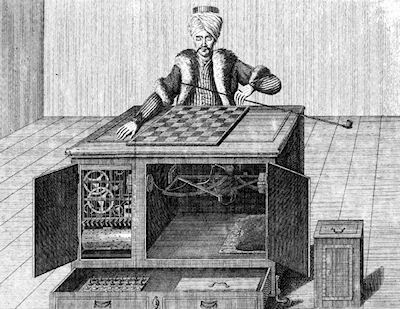 The Turk was a fake chess-playing machine constructed in the late 18th century. From 1770 until its destruction by fire in 1854 it was exhibited by various owners as an automaton, though it was eventually revealed to be an elaborate hoax. Constructed and unveiled in 1770 by Wolfgang von Kempelen, the mechanism appeared to be able to play a strong game of chess against a human opponent. The Turk was in fact a mechanical illusion that allowed a human chess master hiding inside to operate the machine. You should read a book called Curiosity written by Gary Blackwood. It's a juvenile novel that features The Turk.